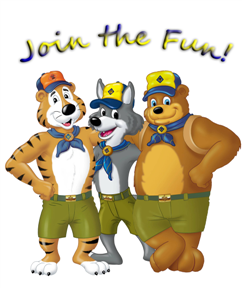 Cub Scouting relies on volunteers to be pack leaders. Volunteers come from all backgrounds and experiences. Plumbers, lawyers, homemakers, teachers, doctors, janitors, and scientists—people from just about every occupation imaginable—are involved in leading youth to become responsible, caring, and competent citizens. This is your Pack too—and taking responsibility to run it will give everyone involved (yourself included) a richer experience. In fact, all Cub Scout parents are expected to participate. In addition to attending our monthly Pack Committee meetings (made up of leaders, parents, and other adults), we have numerous leadership positions that need to be filled every year, ranging from a once-a-year commitment to chair an event, to Den Leader to Pack administration. We encourage parents to consider a role in which they can best use their talents and skills (i.e., Cubmaster, Assistant Cubmaster, Committee Chair, Pack Treasurer, Activities Chairs or as an assistant to a position). And not to worry, there are plenty of training classes to help you along if you feel don't know what to do. Remember, all of the current adult leaders started out where you are—so just jump right up and ask the Cubmaster or another leader how you can help. Treasurer. The treasurer can have other rolls within the Pack like a Den Leader. The treasurer needs to be in communication with the Cub Master, the Committee Chair, and with the Fundraising Chair. Must have experience with Excel, good communication skills, and have regular access to a computer and internet. New Member Coordinator. The New Member Coordinator (NMC) is a new roll for the 2018-1019 season. The NMC assists new scouts and scout families become familier with the pack and the scouting process. The NMC needs to be organized and knowledgeable with the Boy Scouts of America and have good communication skills. Parent Helpers. Parents play an important role in the Pack. Some events need extra adults to help the pack leaders. A parent can pitch in by being a part of the planning committee for special events, give input at meetings, driving a vehicle for a field trip, helping prepare lunch at a day camp, supervising an event at a field day, or supporting unit leaders on an as-needed basis. We Need You... as a Pack Volunteer!